Our Mission: To provide a full service, year round training center within a sustainable budget in a safe, natural environment, utilizing multiple surfaces to optimize racing performance nationwide. We strive to be the most innovative race horse Training Center in North America providing unsurpassed facilities to maximize performance and soundness of the equine athlete. Fair Hill Training Center is situated on 350 acres of rolling hills in the Mid-Atlantic's lush countryside and offers you and your horses the finest in year round amenities. Our Tapeta™ track is just one of the many state of the art facilities we provide to allow your horses to reach their optimal abilities. Additionally, we are conveniently located within easy shipping distance to 10 racetracks. to minimize injuries. 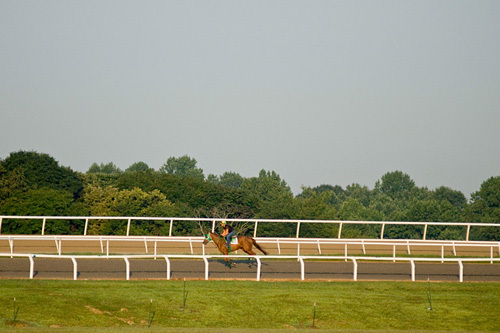 A professional gate crew schools horses from the gate located on the dirt track three or four mornings each week . We have a break for harrowing on the dirt track each morning to enable trainers to breeze horses over a smooth surface later in the morning. 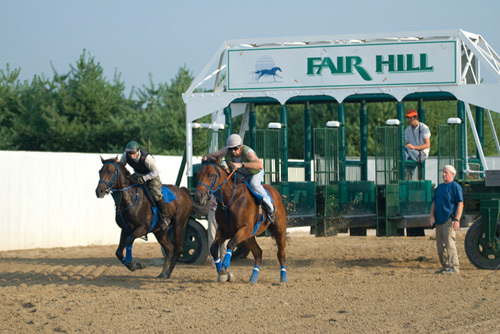 Both tracks stay open until noon to further promote the relaxed training environment at Fair Hill. We have four on-site ponds to provide a regular supply of water when necessary for the dirt track; the Tapeta ™ track does not need water. Watering is done early in the morning so that the dirt track maintains it's moisture longer. 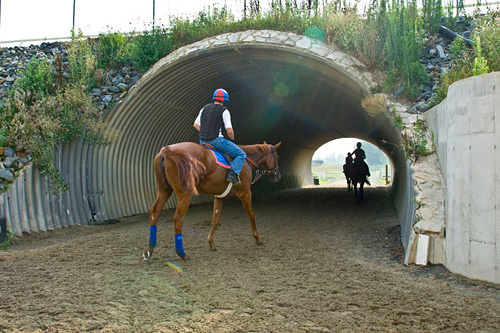 The 7/8-mile all weather Tapeta™ Track, situated inside the dirt track, is easily accessed through a tunnel under the dirt track. It is ideal for horses needing both a forgiving surface and maximum fitness from their training. Its excellent shock-absorbing qualities provide an exceptionally safe alternative training surface. 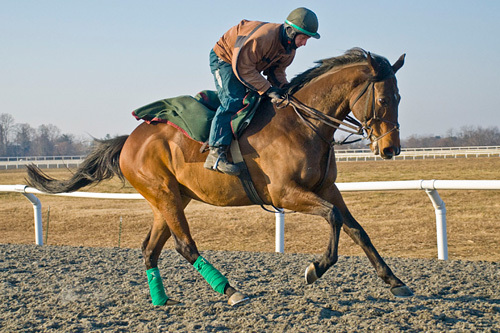 Many horses that dislike training on the dirt, particularly when it is muddy, seem to happily train on the Tapeta™ track. With a professional gate crew and on site veterinary services, the Fair Hill Training Center is well equipped to handle every horse's needs. Fair Hill trainees include Breeder's Cup winners, Kentucky Derby winners, and multiple graded stakes winners.